There are two striking things about the many attempted challenges to Obama’s legitimacy (http://en.wikipedia.org/wiki/Barack_Obama_citizenship_conspiracy_theories) : the failure of Obama to provide conclusive evidence to refute the claims and the questions which just begged to be asked but went unvoiced. My purpose here will concentrate on those two facts. I shall not get involved in questions such as the putative Kenyan birth certificate and alleged photoshop watermarks on the released “certificate of live birth” . As for the question of what constitutes a “ natural born citizen” of the United States, I will touch on that only in so far as it rests on unquestioned facts such as place of birth and the disqualification from the presidency of anyone not born in the USA. What legally qualifies someone to run for presidency? If Obama was born abroad he would prima facie be disqualified from the office of President simply by those two simple constitutional statements. There is the added complication of a father who was not a citizen of the USA. This would offer him dual nationality even if he was born in the USA. What has Obama has done since the story became a public embarrassment for him during the 2008 primaries? Feed the rumour mill by doing the thing most likely to increase suspicion: providing putative evidence which is by its nature inconclusive . This is the certificate which is informally known as a short certificate. The problem is it is neither an original document (it was laser printed in June 2007) nor the full birth certificate compiled at the time of the birth. As such it proves nothing, for it cannot be subjected to forensic tests such as age of paper, nature of ink used and print type to ascertain whether it was created circa 1961. It is worth asking why Obama did not produce his original certificate. It may have been lost , but he does not appear to have claimed this. But even if the original had been lost, it is more than a little strange that Obama did not have a copy dating from before 2007 because he would have needed it for such purposes as obtaining a passport. 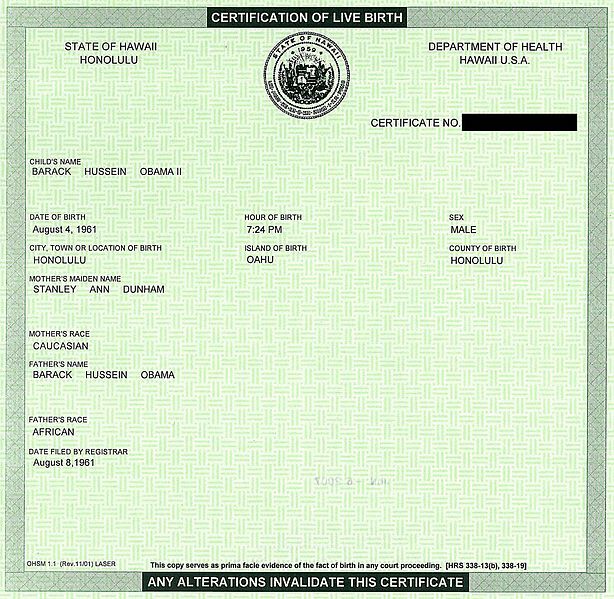 The failure to produce an original document, whether that be a “Certification of Live Birth” or the longer “Certificate of Live Birth” inevitably feeds the suspicion that any document he produced either would not stand up to thorough forensic examination or there is information on the original certificate which shows Obama was born on foreign territory or has some other source of embarrassment . An identical notice appeared in the Honolulu Star-Bulletin. This again proves nothing because it does not give the place of birth. The fact that the it gives an Hawaii address is meaningless as a determinant where Obama was born, because it would be natural for the birth of a child born outside the USA to parents resident in the USA to be announced in their local newspaper. This could have been done by either Obama’s parents or his mother’s parents who were resident in Honolulu. .
‘Advertiser columnist and former Star-Bulletin managing editor Dave Shapiro was not at either paper in 1961, but he remembers how the birth notices process worked years later when both papers were jointly operated by the Hawaii Newspaper Agency — which no longer exists. Three things stand out from this report. First, no one around at the time of the notices being published, either from the papers, the news agency or the Department of Health appears to have verified Shapiro’s statement. Second, presumably there would be nothing to stop the parents or other relatives of a child providing the information directly to the newspapers or the news agency. Third, assuming that Obama was born abroad and then brought back to Hawaii not long after the birth, presumably there would be some medical supervision of the child in his first months of life and it is plausible that in such circumstances details of the birth could have been passed to the Department of Health who then passed them on to the news agency. It might be objected that it would be improbable that his mother would have chosen Kenya rather than the USA to have her child in simply because the medical care available there in 1961 would have been much inferior to that in the USA. However, there is his mother’s penchant for international trekking to take into account and a most powerful reason on his father’s side: that Obama senior wanted his child to be born in his country. A through forensic examination would include testing whether the any official stamp was authentic; whether the paper, print type (the forms were completed by tying judged by the long version example shown above) , the ink used for the typed entries and the ink used for the hand written entries such as signatures were (1) available in 1961 and (2) consistent with that used on other certificates of the same period. The handwritten entries should also be compared with those on other certificates to see if they can be identified as the writing of whoever filled in certificates at that time. It is also possible that the paper would have been watermarked for security reasons and that should be checked. 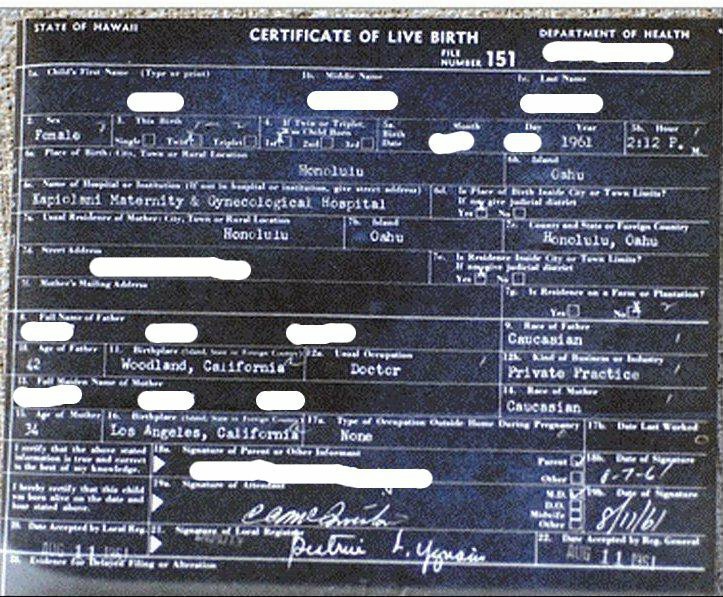 If no watermark exists when it should exist or there is a watermark but it is not identical with that of verified authentic watermarks, it would be most difficult to claim that any document offered as Obama’s genuine record of birth was authentic. A proper investigation would require more than a thorough forensic examination of both the original “certification of live birth “ and the “certificate of live birth” documents. It would also encompass Obama swearing on oath that he was born in Hawaii; getting his surviving close family who were around when he was born to swear on oath that was where he was born; tracking down and questioning under oath medical staff who were at the hospital when he was delivered and the medical staff who attended his mother and Obama in the months immediately following his birth; tracking down those who knew the family then and questioning them under oath; attempting to get the Kenyan authorities to cooperate, searching for people in Kenya who knew Obama’s father and questioning them . Is it really so fantastic to imagine that the US state apparatus might have conspired to suppress the truth by forging documents and making sure they kept quiet anybody who might know something which could have scuppered Obama’s political ambitions at either the presidential candidacy stage or after his election? We know for a fact that the US state sanctions or has sanctioned in the past torture (for example waterboarding), assassinations (http://www.collegiatetimes.com/stories/57/cia-now-allowed-to-assasinate-suspects) and barefaced lying when it suits their purposes. There are also the suspicious deaths of many people such as Vince Foster who carried a threat to those within the state apparatus. Would such people baulk at a little light forgery and intimidation? More broadly, human beings generally have a fear of those with power. A plausible explanation for why judges around the USA have refused to allow challenges to Obama’s presidential legitimacy is fear. They may well fear that if they allowed a case to be heard, they could be at best the subject of a media vilification campaign and at worst find their judicial careers severely hindered. There is also the complication that Obama is black. This means that the full weight of political correctness has worked against anyone in position of authority or influence taking the claims seriously, at least in public, for what politician, public official or media owner would want to be seen as the person who stopped America getting its first black president or bringing its first black president down? What, one might ask, could be a greater harm to a US citizen than a most serious breach of the Constitution? The uniform determination of the US judiciary to disallow legal challenges stinks more than a little. Why has Obama not done everything he could to quash the rumour?